Alien is a unique genre milestone. It challenged the established aesthetic created by 2001: A Space Odyssey of space travel being pristine, clinical and high tech and replaced it with a grimy, industrial quality. The space tug Nostromo is also a conspicuously “blue collar”, civilian venture, underwritten by a large corporation. As for H. R Giger’s xenomorph, it redefined the depiction of extraterrestrial life in movies. Director Ridley Scott brought visual style and atmosphere to particularly unglamorous and dismal setting. He also scared the hell out of audiences at the time with his slow burn story structure and editing style that hints, rather than shows. 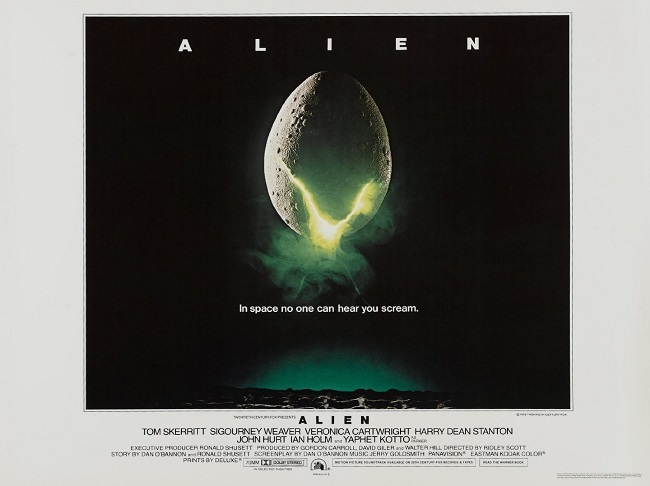 Overall, Alien is a text book example of how to make a horror movie and put a new spin on a classic and well-trodden concept. King Solomon’s Mines is a 1985 Cannon Films production based on the pulp works of H. Rider Haggard. It was quickly made to cash in on the ongoing success of Indiana Jones franchise, although the finished movie bears little resemblance to the classic original novel. Like most Cannon movies from that boom era, it was a cheap and fast enterprise that superficially sported a good cast, but ultimately didn’t do much with them. Veteran director J. Lee Thompson favoured a light and comic approach to the material, as the film’s budget could hardly sustain any major notable set pieces. Yet, it proved popular enough at the box office to warrant a sequel the following year. Allan Quatermain and the Lost City of Gold proved to be as equally silly but by then the public’s interest had waned. Paul Verhoeven has seldom made a movie without some semblance of controversy associated with it, and his 1992 neo-noir Basic Instinct was no different. Even before its US release, Basic Instinct courted controversy due over its overt sexuality and graphic depiction of violence. It was strongly opposed by gay rights activists, who criticised the film's depiction of homosexual relationships and the portrayal of a bisexual woman as a homocidal narcissistic psychopath. The opening murder with an icepick is still shocking twenty six years later and is an excellent showcase for makeup FX artists Rob Bottin. The cinematic character of John J Rambo is heavily associated with the politics of the eighties and the ascending right-wing attitudes of the era. His name has entered the popular sub culture and means different things to different people. His name is used as a pejorative term by certain political lobbies, who see him as stereotypical incarnation of blind patriotism and “might is right” minsdet. It is a name also sadly linked to the Hungerford Massacre in the UK by Michael Ryan in 1987. It was alleged, particularly by tabloid newspapers, that Ryan was inspired by the film Rambo: First Blood Part II, with some claiming he wore armed-forces style clothing. Rambo was cited as an example of a negative media influence, which was particularly relevant in the wake of the controversy over video nasties in the UK at that time. It is now claimed that Ryan had never seen the film, but the allegations provided sensationalist headlines and imagery and so the label stuck.